What originally attracted me to this book in the library was the illustration on the cover. It reminded me of my all-time favorite comic Calvin & Hobbes by Bill Watterson. Wilfred actually has quite a bit in common stylistically with illustrative aspects of Watterson’s work. 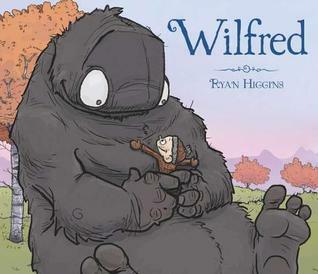 This is the story of Wilfred–a big, hairy monster– and his search for a friend. Lonely and wandering, Wilfred comes upon a town inhabited by tiny, bald people. When he sees the children playing he wants to join in. When he approaches the children run away–all except one little boy. Thus Wilfred finds his friend. When the village adults abuse Wilfred’s generous nature and naivete for their own greedy purposes it is Wilfred’s young friend who comes to his aid. The fact that Wilfred’s small friend is only referred to as “the little boy” helps keep the emphasis of the story on the gentle Wilfred and the message of kindness. This is a beautiful story about love, true friendship and forgiveness. It is an extraordinarily touching story in the tradition of both Max Lucado’s and Mo Willem’s work. The bright, often humorous, illustrations blend with the heartfelt text, meeting the youngest readers with an important message without patronizing them. After having read Wilfred I not only want to add it to my personal library I intend to share it with as many people as possible. I also intend to seek out further work by Ryan Higgins with whose work I am very impressed.